Crazy for cacti? Sweet on succulents? Fuel you passion with all-new designs and projects that will captivate the imagination of gardeners of all ages. Discussing information and ideas from her new book, Sharon Asakawa will share their excitement of weirdly wonderful collectors choices as well as some easy and elegant project plans with designer Robyn Foreman. 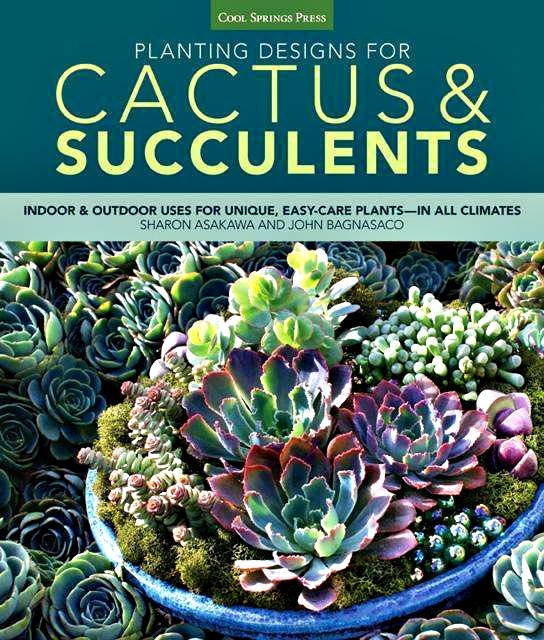 Planting Designs for Cactus and Succulents will be available for purchase and signing by the the authors. John Bagnasco has been an integral part of the gardening industry for over 45 years, starting with a degree in Horticultural Marketing (Michigan State University) and followed by a decade at Frank’s Nursery and Crafts in Detroit. He moved to California to become regional manager and buyer for the Nurseryland division of Sunbelt Nursery Group and then became the head buyer for Armstrong Garden Centers based in Glendora, California. John joined Creative Promotions in October 2000 as a senior magazine editor and radio personality for Garden Compass. He is currently the president and co-host of the nationally syndicated GardenLife Radio Show, which reaches 1.1 million listeners every weekend. He is also the president of www.GardenTube.com, a YouTube-type site for gardeners. As if that’s not enough, he is a partner in SuperNaturals Grafted Vegetables, LLC., has also taught horticulture classes, and is a rose breeder who introduced over a dozen new varieties. He was host of the DVD The Essential Guide to Roses. John’s other books include Plants for the Home Vol I.
Sharon Asakawa and her husband Bruce are, without question, the most highly respected gardening experts in California. Sharon has been part of the nursery industry for decades. She began working in their family gardening center shortly after marrying Bruce in the early 1960s. Ultimately, she was in charge of the floral department where she gained hands-on practical experience. As their business grew, Sharon and Bruce began leading garden tours to great locales around the world, helping introduce the garden travelers to notable gardens and plants. In addition to this book for Cool Springs Press, Sharon is the author or co-author of Bruce and Sharon Asakawa’s California Gardener’s Guide, California Gardener’s Handbook, California Gardening Rhythms, Jackson & Perkins Beautiful Roses Made Easy, andJackson & Perkins Selecting, Growing, and Combining Outstanding Perennials.She is also co-host of the nationally syndicated GardenLife Radio Show, which reaches 1.1 million listeners every weekend. Robyn Foreman is a highly skilled and trained floral designer with more than twenty-five years’ experience. Her business specializes in custom upscale events with a focus on décor and outrageous florals. Nothing is off limits in her design work; if it’s beautiful, alive, and can’t run away on its own, it’s going in an arrangement! Cacti and succulents are perfect for creating many intriguing, lavish looks. Robyn has been featured in the Better Homes and Gardens special-interest publication Country Gardens Magazine, with her fresh take on combining flowers with succulents in everyday arrangements. Shaun Buchanan is a professional User Experience designer and has been designing and photographing for the last decade. As an in-house designer at a plant nursery in North County San Diego where he currently resides with his wife Kate, he developed a love for cacti and succulents while photographing and designing ads for marketing material.